9 Mar 2016 – Three years ago, Amager Bakke kicked off construction in Copenhagen, report BIG. The pow(d)er plant is expected to open to the ski-loving adventurers from the city and abroad by 2018. Located in an industrial area near the city centre the new Waste-to-Energy plant will be an exemplary model in the field of waste management and energy production, as well as an architectural landmark in the cityscape of Copenhagen. The project is the single largest environmental initiative in Denmark and replaces the adjacent outdated Amagerforbraending plant, integrating the latest technologies in waste treatment and environmental performance. Amager Bakke reflects the progressive vision for a new type of waste treatment facility and is conceived as a destination in itself. 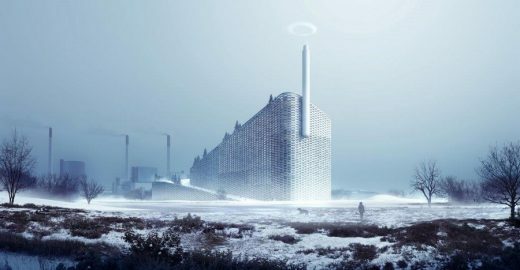 The roof of the new Amager Bakke is turned into a ski slope of varying skill levels for the citizens of Copenhagen, its neighboring municipalities and visitors, mobilizing the architecture and redefining the relationship between the waste plant and the city by expanding the existing recreational activities in the surrounding area into a new breed of waste-to-energy plant. Instead of considering the new Amagerforbraending as an isolated architectural object, the building is conceived as a destination in itself and reflects the progressive vision for a new type of waste treatment facility. The roof of the new Amagerforbraending is turned into a 31.000 m2 ski slope of varying skill levels for the citizens of Copenhagen, its neighboring municipalities and visitors, mobilizing the architecture and redefining the relationship between the waste plant and the city by expanding the existing recreational activities in the surrounding area into a new breed of waste-to-energy plant.